Netflix has come a long way since the days of mailing you DVD’s in little red envelopes. I am a huge Netflix fan and love spending a rainy Saturday afternoon binge watching my favorite show. I found some pretty awesome ways to hack your Netflix account. The most important one? Make sure your binge watching partner hasn’t watched an episode without you – ha! 1) Set Childproof Restrictions. Did you know you can set maturity levels for kids to make sure they aren’t watching things they shouldn’t be? Follow this to change the settings in their profile. There are settings for little kids, older kids, teens and mature. 2) See Viewing Activity. Make sure your husband/friend/sister etc. didn’t watch without you! If you share an account, just head over to Netflix.com/WiViewingActivity and you can see everything that has been watched. It also allows you to delete shows if you don’t want anyone to know you are ahead by two episodes. 3) Discover Hidden Genres. There are so many hidden Netflix categories besides the basic ones like comedies, documentaries, dramas. You can actually unlock hidden categories with secret codes! They get really specific like ‘Romantic Tearjerkers based on Books’. So fun! 4) Find Something to Watch. Not sure what to watch today? Try Netflix Roulette. This is a really fun site where you spin the wheel and it gives you a movie. I got a movie called Dungeon Girl. I had never heard of it, but it was actually really good!! 5) Download Your Favorites. Now you can download movies so you can watch on the go. This has saved so much sanity on our car rides with kids when you don’t need WiFi to watch! 7) Customize Your Profiles. Make your own mood profiles. Instead of having just one profile for yourself with everything in it, create separate ones for when you’re feeling like watching something funny, something sad, etc. 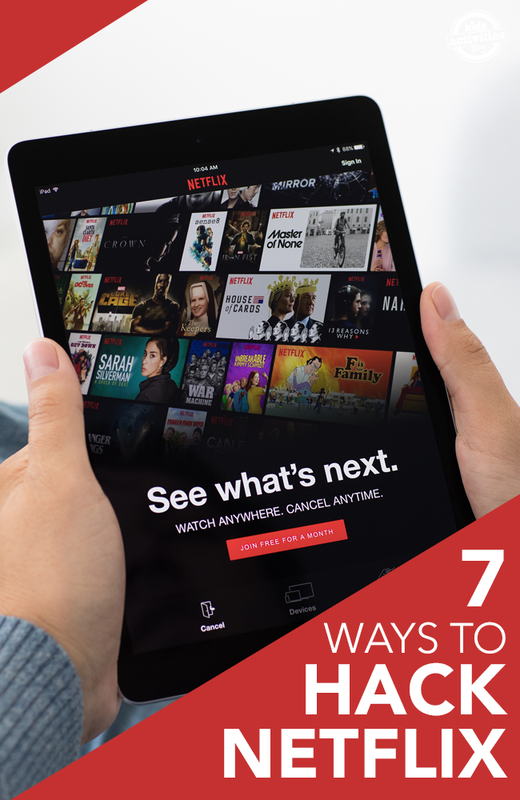 8) Get Netflix for Free. Okay, this is a total bonus but did you know that you can get your Netflix subscription entirely paid for each month? Check out how to get Netflix free here. Have fun with your newfound Netflix knowledge! For more fun tips like this, click here! Hehehe, another way to do that is by using TweakBox. However, thanks for sharing the list. With the help of scrabble word finder words you will easily complete the whole game and you will enjoy very much while playing it which is the best entertaining mind game wih a lot of entertainment. In all sudden i was liking netflix. some of them work for me. Terrarium tv is the best Netflix alternative. Get is from the above link for free. terrarium tv is the free application. It provides good security of the Internet, gives more settings which more helpful for the user. You can set the authority of accessed Internet for different users.